The View from Israel. : 1917 and the Battle of Beer Sheba. 1917 and the Battle of Beer Sheba. 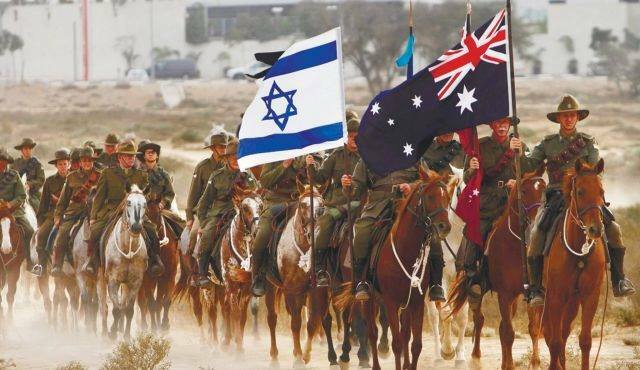 The Prime Ministers of Israel, Australia, and New Zealand will lead much of the Israeli-based diplomatic corps at commemoration events on October 31 to mark the 100th anniversary of the conquest of Beer Sheba. Why is this event so special? The Battle of Beer Sheba was the first major victory for Britain in World War One. Consider this. Going into this battle, Britain had been defeated four times by the Turkish army. The failure of the British to take the Dardanelles led to the resignation of Winston Churchill as First Lord of the Admiralty. His initiative to launch a naval invasion at Gallipoli resulted in 400,000 casualties on both sides and an ignominious Allied retreat. The British army suffered a humiliating defeat in Iraq (then Mesopotamia) when they were surrounded and surrendered to the Turks at the Battle of Kut. The War Cabinet did not see it that way, and Murray was relieved of his duty to be replaced as Commander of what was called ‘The Egyptian Expeditionary Force’ by General Edmund Allenby. This no-nonsense, six foot four tall, military leader, known as ‘The Bull’ for his build and his demeanor, received instructions from British Prime Minister, David Lloyd George, a Welsh Baptist Zionist, to give the British public a gift by taking Jerusalem by Christmas. Allenby adopted a new tactic of military deception by lulling the enemy into thinking he would follow Murray’s example and launch a third major assault on Gaza. Instead, aided and advised by a Palestinian Jew and a Christian Zionist intelligence officer, Allenby was persuaded to swerve south of Gaza and attack Beer Sheba because, as Aaron Aaronsohn, an agronomist from Zichron Yaakov, told him “that is where the water is.” Aaronson’s research convinced him that large reserves of water lay hidden under the hot desert surface of the Negev. As he pointed out to a receptive Allenby, without sufficient water for the hundreds of thousands of men, tens of thousands of horses and camels, and his motorized vehicles, he had no chance of winning the Palestine Campaign. Aaronsohn also knew the trails and wadis that would allow Allenby’s massed troops to negotiate their way from Egypt to Beer Sheba without getting bogged down in the soft desert sands and for his advanced troops to approach Beer Sheba relatively undetected. Despite his name, Richard Meinertzhagen was a swashbuckling British intelligence officer who became an ardent Zionist. He devised a series of ploys that led the Germans and Turks into believing that Allenby planned to attack Gaza again, using an attack on Beer Sheba as a decoy assault. One of his methods was to ride close to the Turkish lines tempting the Turks to come out in pursuit. When the Turks shot at him he pretended to be hit. He dropped a blood spattered haversack and made off as if injured. The satchel contained what appeared to be secret military plans and maps showing Turkish defensive positions at Gaza as well a forged private letter in which an officer wrote to his sweetheart in London about getting ready to move against Gaza. The deception worked. According to reports provided by Aaron’s sister, Sarah, the only woman to head an espionage ring in enemy territory during wartime, Allenby saw that the Turks were bringing up reserves to strengthen their Gaza garrison. The battle began against Beer Sheba on October 31st, 1917, but, by the middle of the afternoon, no discernable progress had been made. Allenby watched the battle, surrounded by his generals, through his binoculars from a hilltop over the southern flatland leading to the town. Looking at a potential defeat, or a withdrawal of forces before darkness fell, the order was given to the Australian 4th and 12th Light Horse Brigades to mount a frontal charge against the enemy’s double-lined defensive trench emplacements. Seven hundred horsemen armed with bayonets rode in three successive lines across a three-mile stretch of open ground. They gradually gained speed until they were in full gallop. With artillery shells and gunfire directed at them they closed on the enemy ranks. The lead horsemen, those that survived the gunfire, leapt over the Turkish infantrymen in their trenches. They job was to take the town and reach the few water wells that had been mined for demolition by the enemy. The second and third line of horsemen leapt the trenches, dismounted, and took on the Turks in hand to hand combat, meeting bullet with bayonet. This was the last great cavalry charge in military history. The enormous courage of the ANZAC soldiers won the day, Beer Sheba was taken, and this battle opened the way for the liberation of Palestine and the fall of the Ottoman Empire. This victory also paved the way for the restoration of the Land of Israel. Read my epic book. It's a fascinating page turner full of drama and personal anecdotes from the people who changed history. He is also the Senior Associate for Public Diplomacy at the Israel Institute for Strategic Studies. World War I was a totally avoidable satanic slugfest on a range of fronts. The whole inferno was a set up. Princip was just the trigger to the first domino falling. Too many young men died because of the policy decisions of various "leaders". Watch Peter Weir's great anti-war movie "Gallipoli". The Nuclear Blast of Russian Collusion. The united Jerusalem Delusion by Barry Shaw.